Baptised: 25th May 1873, Ipswich – parents: Jonathan Steward & Jane Elizabeth Cooke. Died: 1st July 1916; age: 43; KiA. Date of Entry Therein: 27th July 1915 – France. 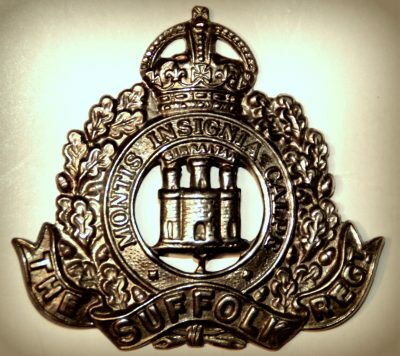 Rank: Sergeant; Service Record: 3/10285; Regiment: Suffolk Regiment, 8th Battalion. 1881 17, Fore Street, Ipswich. Ernest was 8 years old and living with his paternal grandparents. Jonathan Cooke, 62, a Boot maker, born Ipswich. Eliza Cooke, 69, born Ipswich. 1891 17, Fore Street, Ipswich. Ernest was 18 years old, a Lithographer. He was living with his widowed father & siblings. Jonathan Steward Cooke, a Shoemaker – employer, born Ipswich. Dora Louise Cooke, 12, born Ipswich. Constance Ellen Cooke, 10, born Ipswich. Harold Jonathan H. Cooke, 7, born Ipswich. Stanley Ewart Gordon Cooke, 4, born Ipswich. Ernest was 38 years old, a Soldier in the 4th Battalion of the King’s Royal Rifle Corps. Ernest’s mother was Jane Elizabeth Cooke (nee Hewitt), born June 1844, St. Peter’s, Ipswich. Ernest’s father, Jonathan Steward Cooke, died 1909, Ipswich.